The Autozone Liberty Bowl game (named by its title sponsor Autozone) is an annual college football bowl game in the post-season and usually takes place end of December at the Liberty Bowl Memorial Stadium in Memphis, Tennessee. However, starting in 2009 the game was moved to after New Year's Day. The Bowl has a long-lasting history with its inception dating back to 1959. Starting with the 2006 college football season, the game matched the Conference USA champion with a team from the SEC. In the years preceding that change in the match-up we saw the Conference USA champion playing a team from the Big East Conference (1996 and 1997), the Conference USA team facing either the WAC (Western Athletic Conference) champion or an at-large team, taking the WAC champion, if the Cotton Bowl had not already done so (1998), or - as from 1999 - 2005, the opponent for the Conference USA champion was the MWC (Mountain West Conference) champion. But because the MWC champion Utah qualified for the BCS in 2004, the Bowl chose WAC champion Boise State, whereas in 2005, MWC champion TCU chose to play in the Houston Bowl instead of the Bowl in Memphis. At-large WAC team Fresno State took their place instead, loosing against opponent Tulsa 31 to 24. In 2010 the following teams will be matched-up: The East Carolina Pirates, representing East Carolina University (ECU) from Greenville, NC in the Conference USA East vs. the Arkansas Razorbacks, representing the University of Arkansas, Fayetteville, AR in the SEC Western Division. The title sponsor since 2004 is Autozone (NYSE: AZO), which is a Fortune 300 corporation based in Memphis, Tennessee. The company primarily runs retail locations for automotive parts and accessories across the U.S. The previous title sponsor was AXA Financial (1997 - 2003). The Bowl actually originated in Philadelphia (1959 - 1963) before it got moved to Atlantic City, NJ for 1964 and eventually ended up in Memphis in 1965 to be played in the (then brand new) Liberty Memorial Stadium, which is located in Midtown Memphis, Tennessee. It was opened in 1965 under its previous name Memphis Memorial Stadium and kept that name until 1976. 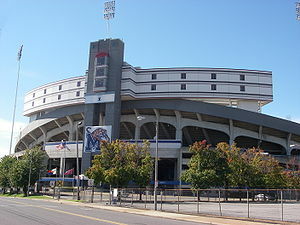 The stadium can hold approximately over 62,000 spectators and houses the University of Memphis Tigers. Buy your Autozone Liberty Bowl Tickets now before it is too late and be one of the tens of thousands enthusiastic fans in this great stadium.